The ABS-CBN Lingkod Kapamilya Foundation, Inc. (ALKFI) joins the Autonomous Region in Muslim Mindanao (ARMM) in providing livelihood and sustainable agriculture to the Municipality of Rajah Buayan in Maguindanao. Pagsulong para sa Kaunlaran ng ARMM! (L-R) Bantay Kalikasan Program Director Jen Santos; Municipality of Radjah Buayan, Maguindanao Mayor Zamzamin L. Ampatuan; ARMM Governor Mujiv Hataman; ABS-CBN Lingkod Kapamilya Foundation, Inc. Chairman Gina Lopez; AFP MGen Edmundo Pangilinan CG, 6ID and; AFP Lt.Col. Joel Q. Mamon CO, 40IB commit to work together to provide livelihood opportunities for the communities in Radjah Buayan. Dubbed as Empowering the Bangsamoro Region through Active Community Engagements in the ARMM (EMBRACE-ARMM), this collaboration intends to set-up an organic farm and a vegetable market, and to train the community for its supervision and maintenance. This endeavor is just one among the series of activities laid out for the protection and for the preservation of ARMM’s natural resources for the next generation. As an expression of support, ARMM Regional Governor Mujiv Hataman and the Municipality of Rajah Buayan Mayor Zamzamin Ampatuan and MGen Edmundo Pangilinan CG 6ID of AFP will be present in this event. Bantay Kalikasan, the environment arm of ALKFI, will be closely working with the community and in ensuring Rajah Buayan’s sustainable and inclusive growth. This municipality is one among the 33 municipalities from the 13 provinces where Bantay Kalikasan’s Green Initiative takes effect. Bantay Kalikasan’s Green Initiative aims to build community-based sustainable tourism (CBST) sites all over the country. The provinces with CBST sites include Palawan, Romblon, Oriental Mindoro, Batangas, Iloilo, Guimaras, Sorsogon, Zambales, Sarangani, South Cotabato, Samar, Leyte and Maguindanao. ALKFI Chairman and staunch environmentalist Gina Lopez explained the contribution of the involved sectors to make this endeavor successful. “So the municipality of Radjah Buayan gave one hectare of land. But it’s not going to work if there is no road. So the ARMM governor committed to build the road, the marketplace and the water system. ABS-CBN Lingkod Kapamilya Foundation, Inc., on the other hand, will donate a truck with refrigerator to the people’s organization to transport the produce of the organic farm. We can make this happen because we have good partners,” Lopez explained. The Armed Forces of the Philippines expressed all-out support for this campaign. 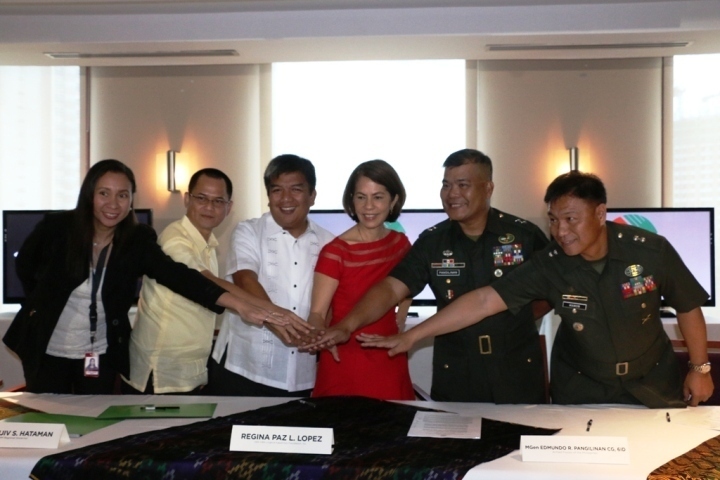 “This venture aims not only to uphold peace and order, but also to provide jobs for the community of Radjah Buayan and eventually, for the entire Central Mindanao,” said AFP MGen Edmundo Pangilinan, CG, 6ID. “It’s about time to recognize the potential of Radjah Buayan. In partnership with ABS-CBN Lingkod Kapamilya, we will put up a hectare-sized model farm to grow vegetables and a market to sell these. These opportunities open a window of opportunity for our municipality – a window of peace,” articulated by Municipality of Radjah Buayan Mayor Zamzamin Ampatuan. “Because of this project, ARMM will have a different reputation. People’s perception will change. And this will mark our history,” ARMM Governor Mujiv Hataman declared. “We have such a beautiful country. I truly believe that the way up for our country is to develop our islands in such a way that the community there benefits,” Lopez expressed.